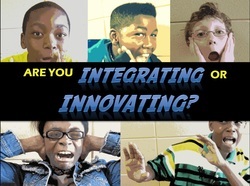 Are You Integrating or Innovating? On this site, you will find the digital hand-outs for each of my presentations. For each presentation, I have provided links to the tools and apps that we discussed as well as examples of the projects created by my students. I have also included some tutorials, research, and other information relevant to the topic. With constant changes being made in the field of technology, these links will be updated often in order to provide you with the most current information. Please stay in touch. I would love to continue these conversations. 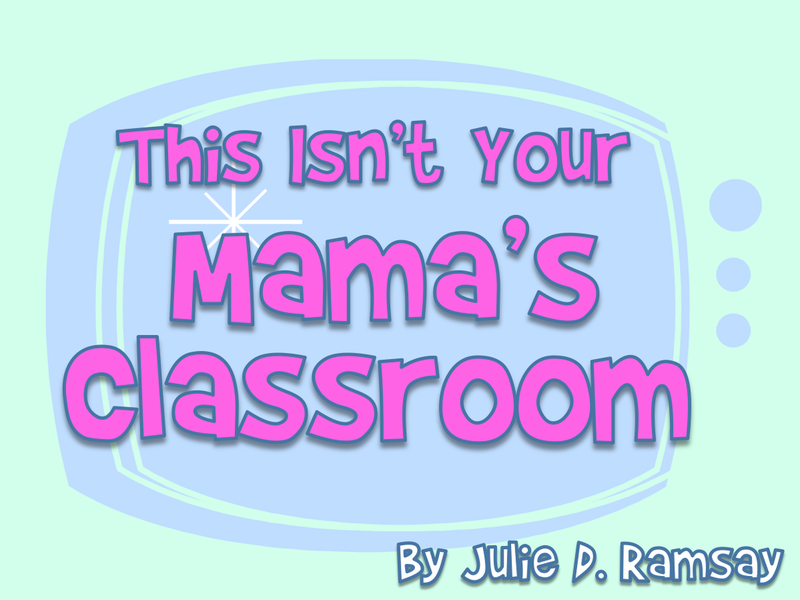 You can follow me on my blog at juliedramsay.blogspot.com, on Twitter and Instagram @juliedramsay, or on my Facebook author/educator page, Julie D. Ramsay. 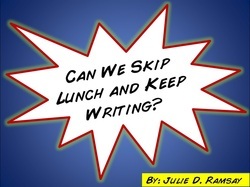 How can we motivate our digital-age students to embrace writing? By guiding our students into finding a relevant reason to write and providing them with an authentic audience, they become highly engaged in creating and communicating through their writing, across content areas. With a collaborative environment supported with digital tools, learners address their individual needs, pursue their interests, and step from the role of learner to leader by becoming experts at genre, mode, and content areas. Engaged in rigorous, critical-thinking writing projects, students not only embrace the opportunity to create and collaborate through their writing, but actively seek more time to continue writing inside and outside of the classroom. 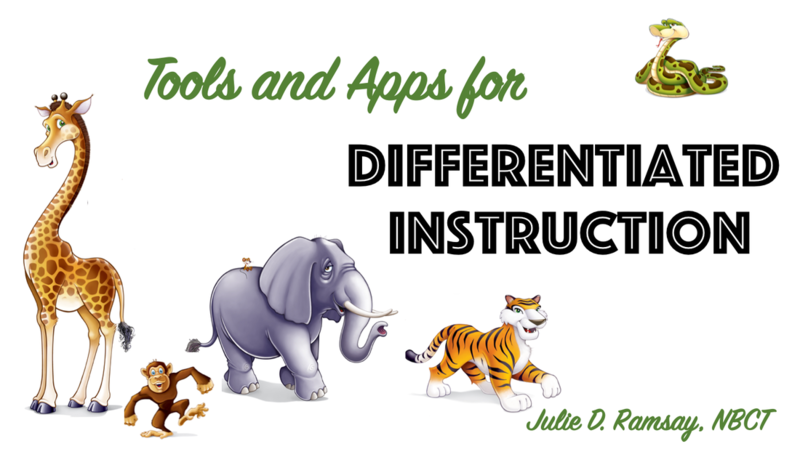 Tools and Apps for Organizing and Supporting Differentiated Instruction: As educators we know that it is crucial for us to know our students, as learners and individuals. Differentiated Instruction is the only way that we can design lessons to meet each individual student’s needs, but sometimes it may seem overwhelming differentiating for so many students in such a limited time frame. Join us as we share some high-tech and low-tech tools and apps to support individual student learning while organizing and managing all of the data collection necessary to document each student’s growth. ​Is the classroom we see on television, film and in media what best meets the needs of today’s learners? Do today’s digital-age students have the same expectations for their learning as their counterparts did ten years ago? As educators, we must evaluate our practices to provide our students the best possible learning opportunities to prepare them for the global community. 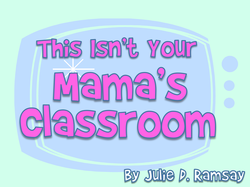 Who designs the learning environment in your classroom? Who creates the projects in which the students engage? How are the students assessed and who decides how they are assessed? In this session, we’ll discuss strategies for guiding students as they design their own learning paths and fostering a student-directed, collaborative environment using the digital resources and tools that appeal to today's learner. Learn management techniques and see many student projects that result from being in the classroom of today. Are you Integrating or Innovating in the Classroom? Is there a difference between integrating technology into the classroom and innovating with digital age learning skills? Today there is much discussion and focus on the technology tools that are being brought into the classroom, but often time the focus becomes on the tools and not on the actual learning. This discussion focuses on strategies and practices that challenge our perceptions of digital literacies and the role of technology in today’s classroom. Is adding a technology project into our regular classroom routine enough? Will it help our students become competitive in today’s global society? Is there a key ingredient that our instruction must include? We will discuss best practices on meeting ISTE National Educational Technology Standards for Students, how to give students the tools to make decisions and guide their learning choices, and what innovation looks like in today’s classroom. ​Putting Students in the Driver's Seat of their Own Learning Journey: What do today's digital age students want from their learning experiences? By guiding our students into finding a relevant reason to read and write as well as providing them with an authentic audience, they become highly engaged in creating and communicating through their writing, across content areas. With a collaborative environment supported with digital tools, learners address their individual needs, pursue their interests, foster curiosity, and step from the role of learner to leader by becoming experts. Engaged in meaningful, critical-thinking writing projects, students not only embrace the opportunity to create and collaborate through their writing, but also actively seek more time to continue writing inside and outside of the classroom. ​Tools and Apps for Amplifying Student Voices through Formative Assessment: In today’s test-centric world, we may wonder how much of the content standards our students are really mastering. Through the use of formative assessment, supported by digital tools, we can determine exactly what each student has mastered. When students are given the opportunity to design their own rubrics, set their own goals, publish their own digital portfolios, and reflect on what and how they’ve learned, assessment becomes a personal investment for each student. Although managing formative assessment may seem time-consuming, simple strategies and digital tools shared in this presentation will enable teachers to easily facilitate it within their own classroom, empowering their own students to make their own choices. 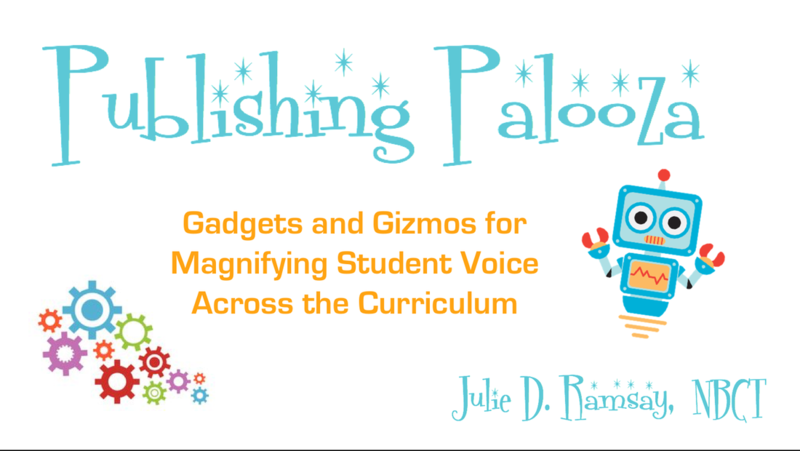 Gadgets and Gizmos for Magnifying Student Voice Across the Curriculum: Today’s students crave having an authentic audience for their learning. Having multiple ways for learners to publish across content areas allows us to differentiate our instruction, foster our students’ creativity, and tap into a learner’s interest providing our students with the best tools to grow as thinkers. Staying on top of the newest quality publishing tools and social media platforms can feel like a balancing act. In this session, learn strategies for empowering your students with social media in addition to many tools that learners can add to their publishing toolbox. See student examples of how each tool is used to give a student their own unique voice. ​One Book to Connect the World: Do you want to give your students an exciting, authentic reason to read and discuss a great book? 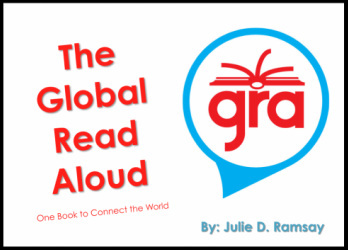 Through different web tools and apps, the Global Read Aloud provides students an authentic reason to read, discuss, write, and publish with thousands of other students from around the world. By connecting with a strong network of fellow educators, you bring the world into your classroom promoting literacy and supporting digital standards. 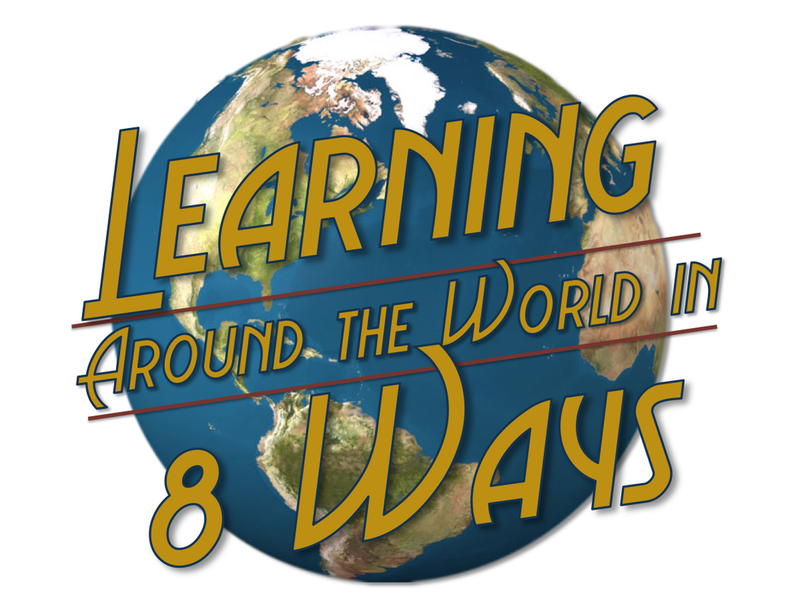 Learn about the Global Read Aloud project, methods of becoming connected with other classes, and strategies for making this project work in your classroom. Using Literacy to Fuel Inquiry, Creativity, and Student Voice: Makerspaces are an informal space that provides opportunities for students to explore, create, and design.Through Makerspaces, learners have the opportunity to critically think, reason, and problem solve in the pursuit of making something that is meaningful for them. 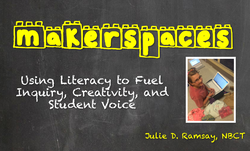 Learn how one teacher turned her middle school ELA classroom into a makerspace in order to empower students’ voice in their learning and to engage in meaningful collaboration while authentically utilizing and growing their literacy skills. Designing Rubrics that Promote Mastery and Student-Directed Learning:With the influx of students pursuing authentic, project-based learning to demonstrate mastery, how can we ensure that each student is fairly and objectively being assessed? 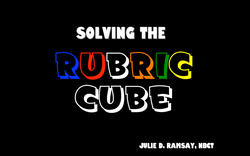 Are rubrics the answer? If so, what constitutes a valuable and equitable rubric? Learn strategies for designing powerful rubrics that guide students towards mastery of standards and put the power of rubric creation into the hands of learners. ​​With today’s multitude of digital learning opportunities, how do we find connections that will blend into our curriculum while positively impacting each one of our student’s learning? By using digital tools and global projects, you can empower your students to connect with their peers worldwide to collaborate, communicate, and create authentic learning experiences across content areas and grade levels. Through global collaboration, students become highly motivated to reach beyond the standards into meaningful, engaging learning. 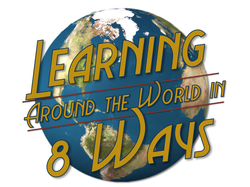 Learn about existing projects like the Global Read Aloud, International Dot Day, Global Genius Hour, Mystery Skype, and Quadblogging, as well as strategies for beginning your own project. ​Foster Student-Directed Learning: Learn how by creating a student-driven classroom and using technology supported projects, learners become self-motivated experts at mastering state and national standards and in integrating digital age learning skills into their lives inside and outside the classroom walls. 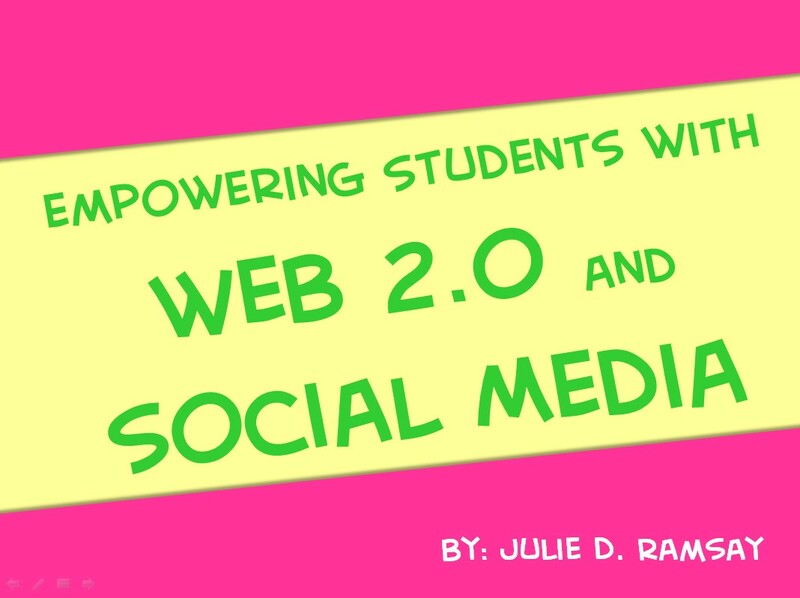 With the effective support of Web 2.0 tools and social media, learning becomes relevant to students while advancing critical thinking, collaboration, communication skills, and creativity. With these tools students are empowered to make thoughtful and powerful choices for their own learning journey. 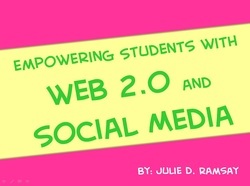 See collaboratively-produced Web 2.0 projects and social media applications spanning grade-levels and content areas. What is Pinterest and why would I want to use it? 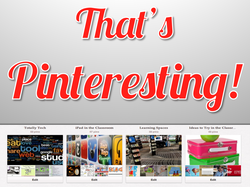 Pinterest is a virtual pin-board where one can pin images, and their URLs, from websites across the Internet. The boards one creates can become an excellent tool for organizing resources and connect (and learn) with others from around the world. Join me in this informal session to learn how to set up a Pinterest account, manage it to strengthen your teaching practice, drive an audience to your professional blog, and create a professional development hub for your school, district, or organization. 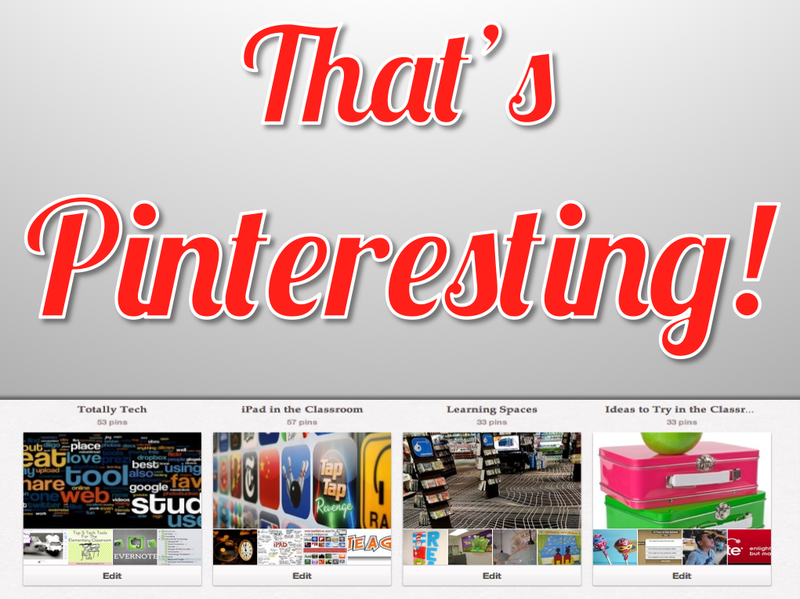 It's fun, it's educational, it's Pinteresting!